ITS A VERY COMFORTABLE AND COZY APARTMENT, FULL OF LIGHT, PLANTS, VERY SPACIOUS AND BEAUTIFUL. ITS QUIET AND PRIVATE, AND WITH FABULOUS VIEWS, ONE APARTMENT PER FLOOR . BALCONY ALL AROUD THE APARTMENT AND 3 BIG ROOMS, 2 FULL BATHROOMS, LIVING ROOM AND KITCHEN. ÌN THE BEST LOCATION, SAFE AND SURRENDER BY ALL YOU NEED TO ENJOY. CONDESA IS ONE OF THE MOST BEAUTIFUL PLACES IN MEXICO CITY. VERY WELL LOCATED SURROUNDED BY TREES, PARKS, A WIDE VARIETY OF RESTAURANTS, BARS, CAFES, ENTERTAINMENT, CULTURAL ACTIVITIES, GALLERIES. IT IS A SAFE PLACE WHERE EVERYTHING IS WALKING DISTANCE. A PRIVILEGE SPOT WHERE YOU CAN HAVE EASY ACCESS TO ANY PLACE AROUND THE CITY. Claudia & her daughter were both very helpful with suggestions, orientation etc. The beds were all great, lovely living space & quiet area. Claudia is aware some work is needed in the bathrooms, but they worked fine for our visit. Would definitely stay again. Good residential neighborhood. Lots of cafes and restaurants within walking distance. 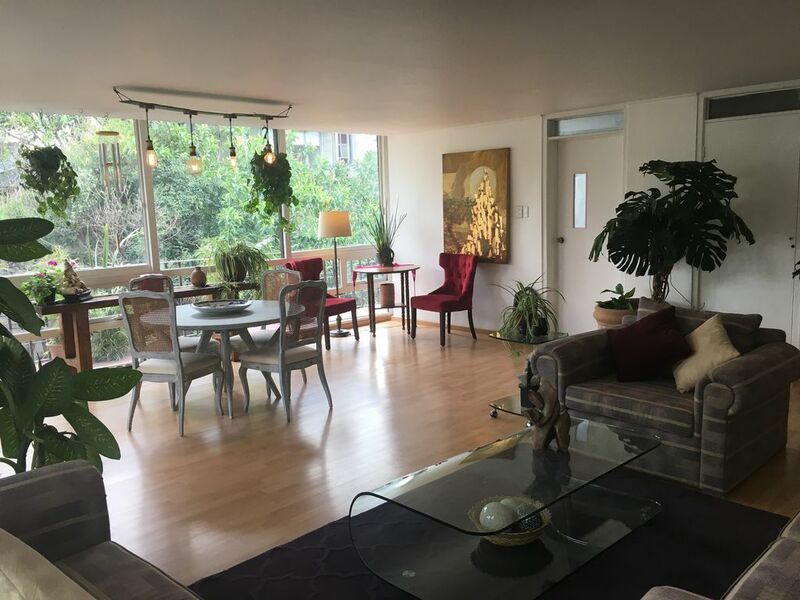 This was a great apartment that was located in an excellent area in the Condesa neighborhood. The apartment was well equipped for our needs and was clean and ready to go when we arrived. Claudia was easy to work with and her daughter who met us, did a good job giving us directions and tips to the neighborhood. The area is quiet but there is easy access to lots of great places to eat and have fun. We would return.